With the short time span in which the U.S. Carbines were developed and started production, inevitably their use in the field would reveal the need for changes or modifications to the existing design. Additionally, the Ordnance Department and/or one of the prime contractors and/or subcontractors found ways to improve performance, decrease weight, decrease production time, conserve metals, or decrease production costs. To the credit of the original design, none of these changes were mandatory replacements, or mandatory upgrades for the prime contractors when assembling carbines during the war. Not until after the war did the Ordnance Department indicate a number of mandated modifications and parts for the carbines, for the post war overhauls. 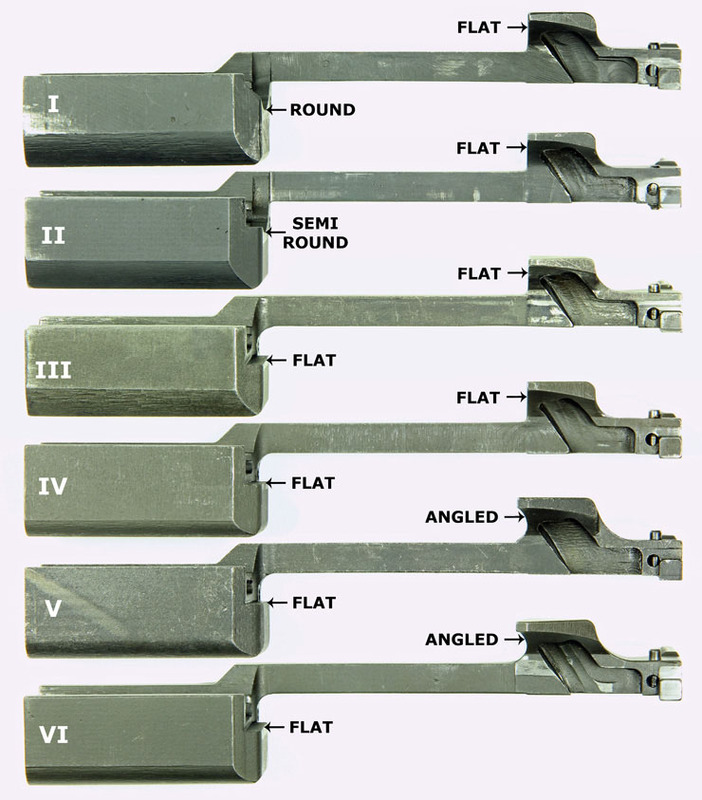 For a list of these post war modifications and parts refer to the page on Post WWII Ordnance Operations. Due to the standards set by the Ordnance Dept. all part variations were forward and backward compatible with the U.S. Carbines regardless of who manufactured them or when. 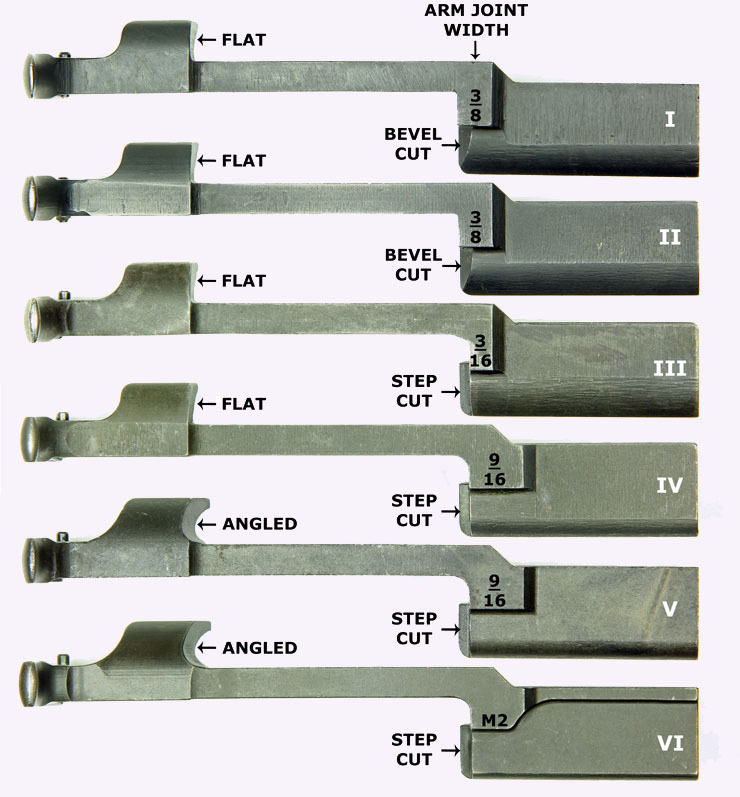 Generally when a new variation of a part was approved by the Ordnance Dept., it was manufactured and became available for the assembly process within a matter of weeks or a couple months. When contractors received these new variations they were added in with the existing variations with both variations being used until the inventory of the previous variation was used up. As such, the later variation wasn't a "replacement" part in the sense of replacing parts as it was an improvement to the prior design. Just because a newer version of a part was approved by the Ordnance Dept. does not mean every manufacturer assembling carbines used them. One example was the stamped and brazed trigger housing, none of which have been found with the markings of Inland or their subcontractors. While all changes to parts required approval of the Ordnance Department, it is not unusual to find minor variations specific to a manufacture or subcontractor due to a difference in machines, machining, and/or procedures used by a particular manufacturer. One example would be the small notch on the rear of the triggers manufactured by Saginaw Steering Gear in Grand Rapids, MI. 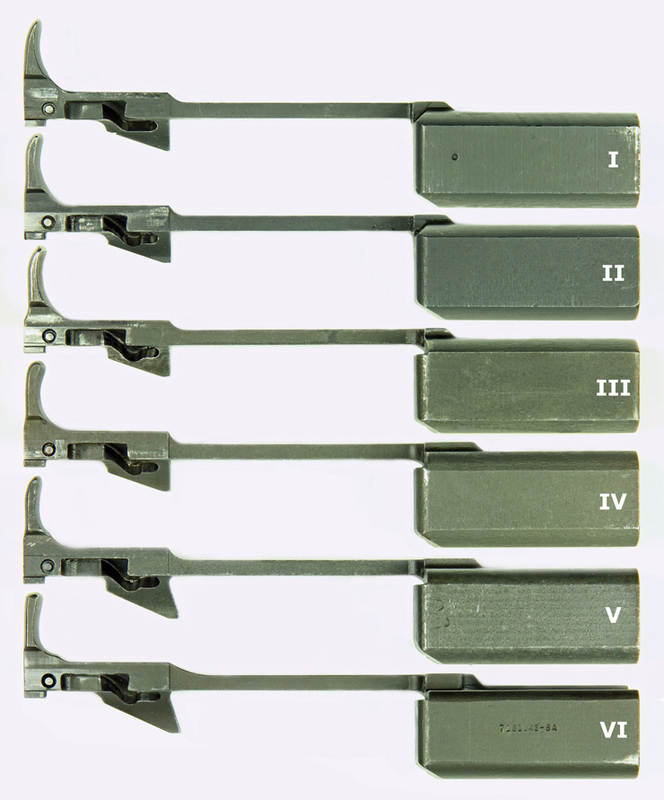 There were five basic variations of the slides manufactured for the U.S. Carbines, with a sixth likely due to a difference in manufacturing based on who manufactured them as opposed to an Ordnance Dept. approved change. Circular cut at the rear of the slide body, flat cut inside the top of the cam that engages the right bolt lug. Semi-circle cut at the rear of the slide body, V shaped cut inside the top of the cam that engages the right bolt lug. The V shaped cut was retained for future versions. The circle/semi-circle cut at the rear of the slide body was flattened, the bevel cut was changed to a step cut, the width of the arm joint reduced to 3/16". The flat cut at the rear of the slide body and the step cut were retained on later versions. The width of the arm joint was increased to 9/16" to prevent bending or breakage, and retained on later versions. The flat cam was changed to an angled cam to assist with the ejection of spent shell casings away from the breach. The angled cam was retained for future versions. 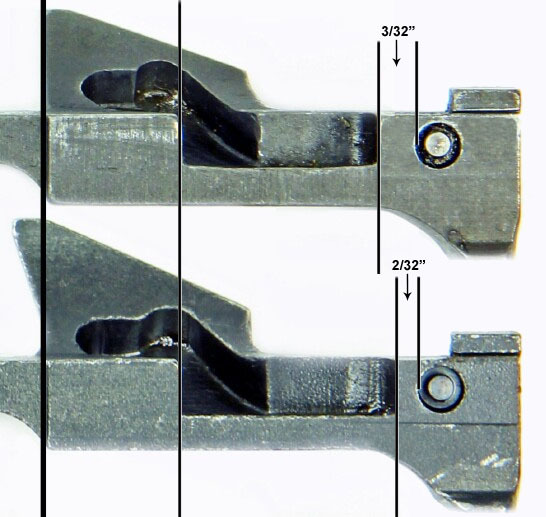 During production of this variation the decision was made to increase the distance the slide traveled rearward before unlocking the bolt, to improve ejection and reduce flash at the breech. Approximately .40" was removed from the inside of the rear of the slide, where it abuts the gas piston. The opening of the cam cut for the right bolt lug was moved .040" farther forward (see pic below). To aid in the recognition of the earlier type V from the later type V the Ordnance drawing number/stock number 7160091 was added to the outside bottom of the later design. 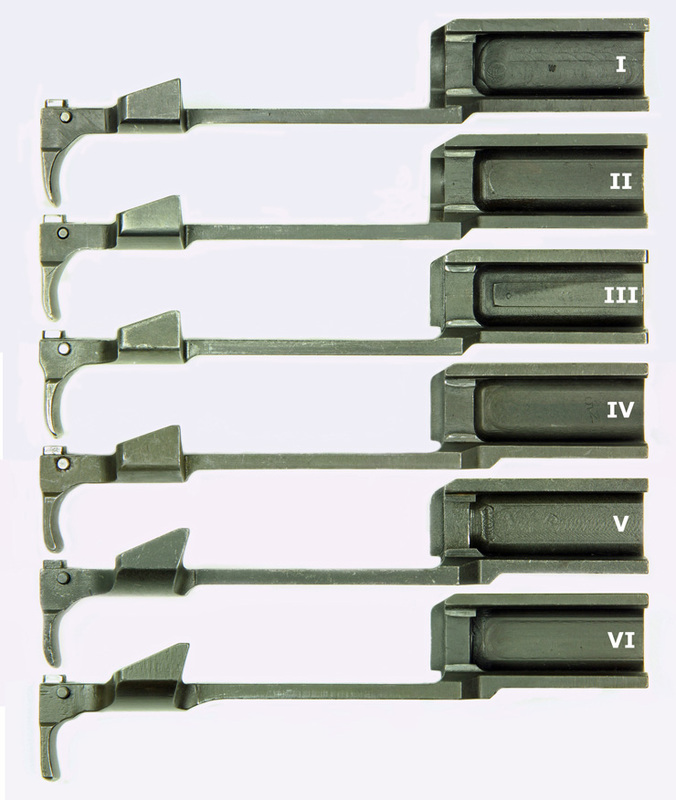 Re-designed to engage the Disconnect Lever for the Model M2 select fire mechanism, but used on both the M1 and M2. Ordnance drawing number/stock number 7161843 was added to the outside bottom of the slide body. The type I slide was cut flat inside the cam that engages the right bolt lug (top). Type II and later slides have a V shaped cut (bottom). Positioning the slide .040" farther forward necessitated a .040" increase in the cam cut for the right bolt lug (below). drawing/part number 7160091 was added to the bottom of the slide. The type VI M2 slide has Ordnance drawing/part number 7161843 on the bottom of the slide. The SA on this slide identified the manufacturer as Springfield Armory. 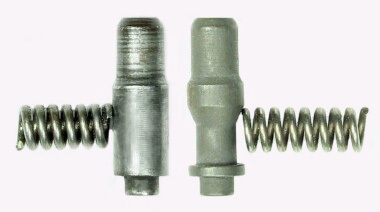 Two types of slide stops and their associated spring were used. The slide stop & spring (left) was eventually superseded by the slide stop & spring (right). Slide recoil springs were the same throughout production, with 120 coils .258" in diameter with an overall length of approximately 10 1/4". one end or the other which altered the length slightly.